Spring cleaning just got easier for you and your loved ones in April. 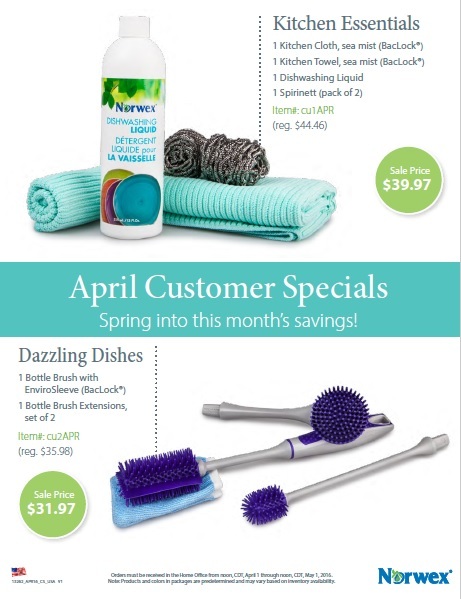 Norwex is offering its Kitchen Essential pack at discounted rates, including which includes one sea mist Kitchen Cloth, one seat mist Kitchen Towel, one bottle of Dishwashing Liquid and one pack of Spirinetts — for $44.46 (normally priced at $49.97). EnviroSleeve and Bottle Brush extensions. For a look at these specials hit this link — and then head to Pam Altendorf’s online shop to stock up on these and other great deals.